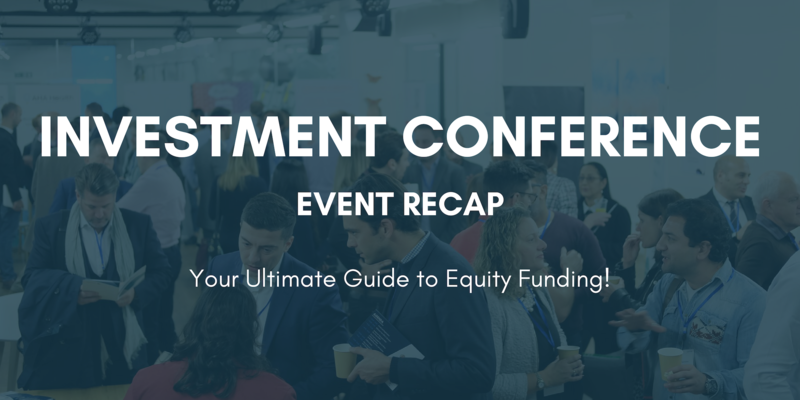 Our long-awaited Investment Conference turned out to be a massive success, and we at the Business Funding Show wanted to share an overview of everything that went on! From accelerators and crowdfunding platforms, through to business angel networks and VC firms, the event had it all, even a presentation on why raising funds is a bad idea! Thank you to Cocoon Networks for their amazing venue, as well as our sponsors: A City Law Firm, Thinkroom, GovGrant & HAUS. No matter your stage or sector, or what you're seeking, there is something here for every entrepreneur to consider. A special thanks goes to all the funders, panellists and speakers who contributed their invaluable knowledge to give us an incredibly cohesive view of the subject of equity funding. Investment Rewind and What the Future Holds? Panel moderated by Arina Osiannaya of Funding Matches. The panel was unison in saying that equity funding drives the UK economy in multiple ways. As Marilena related, the market has experienced major growth in the past four years, with more companies now having the opportunity to 'move all the way from startup to successful international business'. If you're in the early stages, bootstrapping and maxing out credit cards can work well up to a point, but taking on equity funding really becomes the tagging point for most businesses, in terms of being able to accelerate growth much more rapidly. Whereas for scaleups, it provides the capital, support, and industry contacts needed for sustainable growth and expansion. Jenny pointed out that the reluctance to giving away a part of their business is a common phenomenon amongst entrepreneurs, and is often unfounded: 'The truth is that the investment helps you do all the things you want to do: hiring staff, expand customer base, etc. and sometimes giving away a portion of your equity is a small price to pay'. · Think of equity funding in terms of the opportunities it creates, rather than dilution or 'giving away control'. Without support, you won't be able to scale. · It helps you tap into an investor's extensive network of potential customers or even new team members – things you otherwise wouldn't have access to. · Think about the equity you need for the stage you're at – not all equity is the same: what you get from angel investors is not the same as what you'd get from VC. Always choose someone who can bring enough value into your business (not just capital). · Plan what you need and why you need it, and how much of your business you want to give away at any given stage. As Mark explained, investors are always looking to minimise their risks and losses, therefore entrepreneurs should check their SEIS/EIS eligibility before fundraising, to see if they can offer potential investors an added incentive. These schemes offer 50% (startups) and 30% (scaleups) tax breaks respectively for any qualifying investment. This is something that a lot of VCs especially will hold as a requirement. As Nigel rightly observed, cutting edge disruptive technology led businesses are very risky endeavours. Sometimes companies need equity funding to tackle this risk with a view that if successful, there will be a significant upside. This so-called 'risk capital' is absolutely essential, but a lot of companies are undercapitalised in this regard, lacking the financial resources to take the kind of risk that they're taking. Nigel's advice was 'don't be risk averse and don't be equity averse'. Raise the right sort of capital, and the right amount, at the right time. 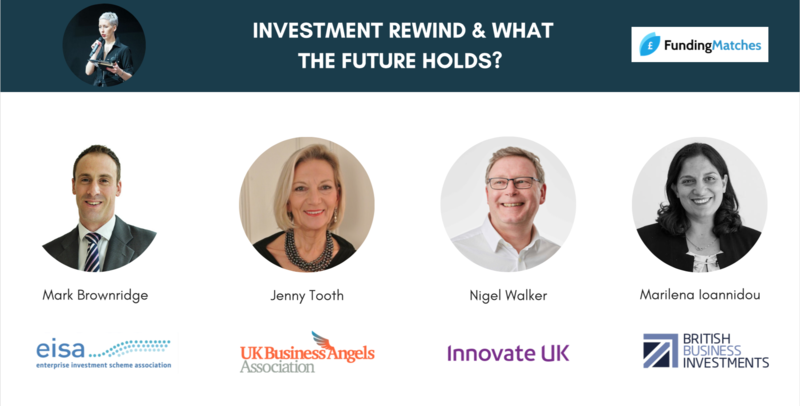 · Early investment incentive.The introduction of SEIS in 2012 has had a massive impact: when angels began getting 50% tax breaks for backing early-stage businesses (less than two years old), it encouraged them to invest earlier, and more. · Syndication is the name of the game.The rise of syndication has enabled angels to come together, and the size of deals has grown massively. Effectively, small businesses can now get up to £1.5M in their first round of investment. · Co-investing.The introduction of angel co-investment funds was also really useful in leveraging angel money. This – paralleled with the launch of crowdfunding – brought in a massive democratisation in investing, and consequently opened up the process of accessing equity tremendously. It is true that technology is the overwhelming factor which defines most investment decisions nowadays. When asked about the most popular sectors, the panellists mentioned data analytics more than once; 'that's where the future is', said Marilena. Sectors like healthcare, AI, and big data are extremely important, and a driver of the trend towards personalised medicine. Innovate UK also has certain schemes that are focused around key elements of the government's industrial strategy: mobility, battery technologies, autonomous vehicles, etc. BBI on the other hand, has funds that are specific to life sciences, or the space industry, utilising their £2.5B pool of capital with an aim of supporting VC funds, and driving growth even further. The great thing about these businesses is that they're global; showing global potential is something that could work well in your favour when pitching for investment. Why do so many VC backed businesses fail? · Too much money makes entrepreneurs sloppy. · We know empirically that 'Plan A' for any new venture rarely works, but the investor wants the entrepreneur to flawlessly implement it anyway! · Raising a seed round is not a predictor of entrepreneurial success. In fact, the amount of seed/series A money raised in a lot of cases is inversely correlated with success! · Most VC struggle to deliver returns. As we can see, around 1/5 of all funds returned less than 0% of invested capital. Roughly another 1/3 of all funds delivered low, single-digit returns. 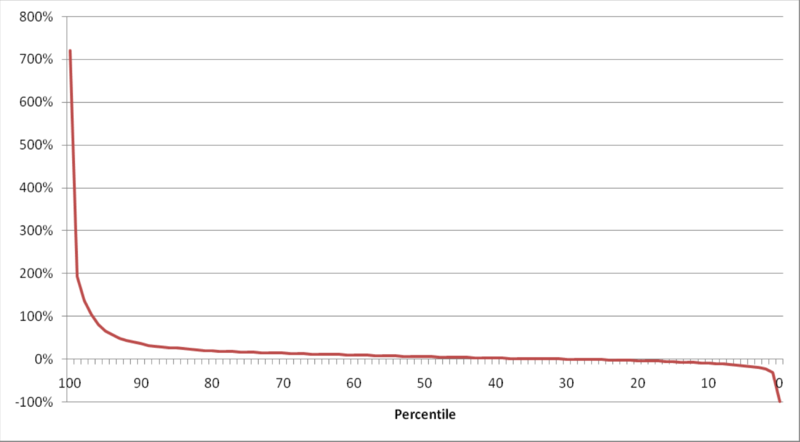 Fewer than 10% of all funds succeeded in delivering at least 20% returns. Raising VC funding too early is a dangerous practice. Why? · It's a big distraction. It's extremely hard and time-consuming. If you're spending full-time on raising money, you aren'tspending any time on actually building your business. Get your priorities straight! · A lot of the time you're just creating hype without actually proving your concept. · From the investor's point of view, it is a high-risk undertaking, therefore the founder will get a much lower stake or poor contract terms. · The shareholder's agreement is baggage for entrepreneurs. The fact is that a large proportion of SMEs never (or rarely) raise external capital, whether this be equity, or even debt or grants. Therefore, perhaps external funding should not be seen as the first port of call for getting nascent entrepreneurial ventures off the ground. Essentially, in each of these five customer-funded models, the entrepreneur gets their hands on their customers' money before having to pay suppliers. That's exactly what Michael Dell did to get his personal computer business off the ground more than 30 years ago. It's also what Bill Gates and Paul Allen did to start Microsoft. If the customer says that they don't want to pay for your product in advance… maybe this is really good information for you to have now, rather than later! The key, as John outlined, is to have a business that solves a genuine problem, as whoever has that problem will pay you to solve it, and they will pay in advance. Nobody will pay you to solve a non-problem! The sooner you find out whether this is the case with you, the better off you'll be, as you won't be wasting your time. John did say however, that entrepreneurs shouldn't dismiss VC funding entirely. The point is that they should develop their business enough, for it to be worth pursuing institutional money later down the line. Having enough of a customer base and traction works enormously to your advantage, and will enable you to subsequently raise potential VC money on much better terms – you could even have VCs queuing for you, not the other way around! 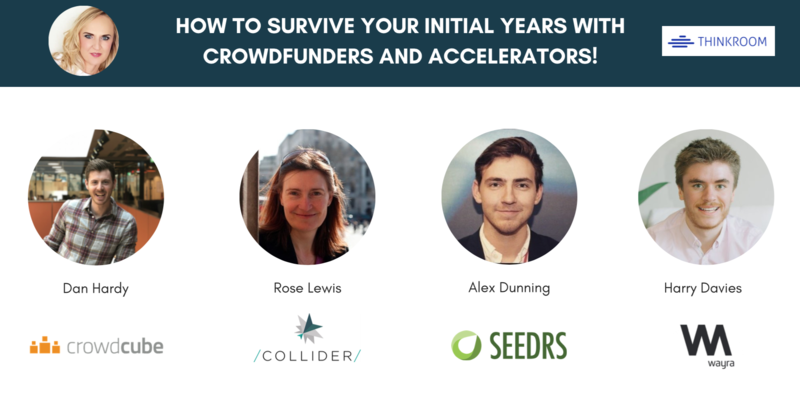 How to Survive Your Initial Years with Crowdfunders and Accelerators! Panel moderated by Catherine Young of Thinkroom. Entrepreneurs should be very aware of what they want from an accelerator – there's no point being on a programme and not engaging with it. If however, you are aligned with what the programme has to offer, you have a lot to gain from it. As Rose explained, when startups leave an accelerator, they are 'better equipped to face the challenges of growth and development' – they have a bigger network, and continued support and advice. Programmes can also give them access to a number of investors, who can support them for life, forming a very powerful set of ambassadors for their product. When describing the Wayra model, Harry outlined that the goal is to help startups with their proof of concept, pilots and commercial contracts. When talking about the latter, he related that 'corporates are inherently risk-averse, and if you're a pre-seed organisation, you should tread carefully'. There needs to be some traction present, with a robust and scalable product, providing some sort of initial validation. Crowdfunding was born out of the need for early-stage companies to raise money. There are however enormous secondary and tertiary benefits to doing a large public raise, including both customer acquisition and awareness. It also allows companies to actually market test a product that may only be in planning phase, ultimately helping to promote it before it has launched. As Dan and Alex both explained, companies today use crowdfunding as a way of acquiring users, but also of turning their customers into shareholders. What you end up with is a very valuable community of early adopters who have a vested interest in the financial success of your company. Taking this into account, crowdfunding is being increasingly utilised not only by startups, but also bigger, scaling companies. · Be coachable. Early-stage investors (especially accelerators and incubators) like to work with entrepreneurs who have strong views and are willing to make decisions, but at the same time are ready to learn and be open to new solutions. · Be flexible. It is understandable that entrepreneurs who have worked on a product for a very long time, and have a specific vision for it, can often be quite reluctant to change. However, treating the product like your 'baby' can often make you somewhat blind to what is working and what isn't. Sometimes pivoting your strategy can ultimately make your product much better! · Network! This is especially important if you're struggling to find investors: meet with like-minded entrepreneurs and seek advice. They will most probably be quite giving with the knowledge and networks they possess. There is a multitude of events out there – make sure to utilise them! Keep in mind that only 1.2% of entrepreneurs who get funded by VCs or angels have come as a cold call – the rest are all introduced through networks. The Hacker Panel to Angel Investing! Panel moderated by Karen Holdenof A City Law Firm. Business angels network platforms can certainly be quite busy. As Xavier related, AIN looks at 'about 80-100 pitch decks a day'. How do you differentiate yourself from such a big crowd? · First of all, a clear and understandable presentation is key; collect data around your company and have it presented in a form that's legible. 'We see a lot of intelligent people with very sophisticated businesses, but if we can't understand it, then we can't translate it to our investors' – said Xavier. · A partnership with an angel can last a very long time. You have to strike a chemistry, both internally within the team and externally with investors – all goals have to be aligned, otherwise it won't work out. · 'What really matters is the execution', put in Angelika. You can have a fantastic plan and team, but investors want to know how you see your next steps. · Present evidence of all your estimations, assumptions and assertions. Do you know your market? Is your plan realistic? As Tim explained, when potential investors first do their research on a company, they're constantly looking for reasons to say 'no'. If they find one, that's the end of the process; however, if they get to the end and they haven't – that's when they'll consider investing. The diligence process is effectively about digging into every aspect of the business – what's your background? Are you credible in this space? When negotiating with an investor, a good trick to use is letting them know that somebody else is also interested. 'Nothing else will help you more', assured Goncalo. The best way to deal with unfortunate outcomes is to think through them before they happen – said Tim. When going out to fundraise you have to ask yourself some fundamental questions: do I want this person invested in my company, and am I happy with the level of control that they will yield through our agreement? Having a disruptive investor in your company could be very detrimental, therefore if you see any red flags when negotiating – walk away. Transparency with legal documentation is extremely important. You should seek good legal advice if you have trouble with understanding your contracts. As Goncalo outlined, it's important to remember that different investors will be useful to you at different business stages. Often the angels who were incredibly useful at the startup stage, become naturally less involved at the scaleup stage if they lack the relevant experience. As Xavier said, angel networks often launch campaigns around the world, and this is certainly true of AIN, which has 30 branches extending to 80 countries. Some noteworthy markets include Thailand, Hong-Kong, Singapore, and the Middle East. There is plenty of money coming in from these countries into UK businesses, and equally, they look for expansion into their territories as well. Angelika outlined that SFC on the other hand focuses specifically on the market of China, which presents ample opportunity and can be especially lucrative for companies in the deep-tech sectors. So, do angels want to see you show a global appetite from an early stage? 'It depends' was the prevalent answer. Ambition is a good thing to show potential investors, so if you can demonstrate global potential, this could lend a lot of credence to your case. This however, has to be coupled with solid realism. Show that your thinking about it, but don't be naive with your estimates. 'It is guaranteed that 3 years on from writing your business plan, half of the assumptions which you make will turn out to be wrong', said Tim. Your business plan will evolve, you'll pivot and change – therefore showing flexibility and adaptability is critical. Panel moderated by Annie Hunter of GovGrant. VC funding is the hardest out of all equity options to obtain. Investing between £250K and £10M, VCs provide not only big financial capital but also possible future rounds, alongside expert management support and strong connections. 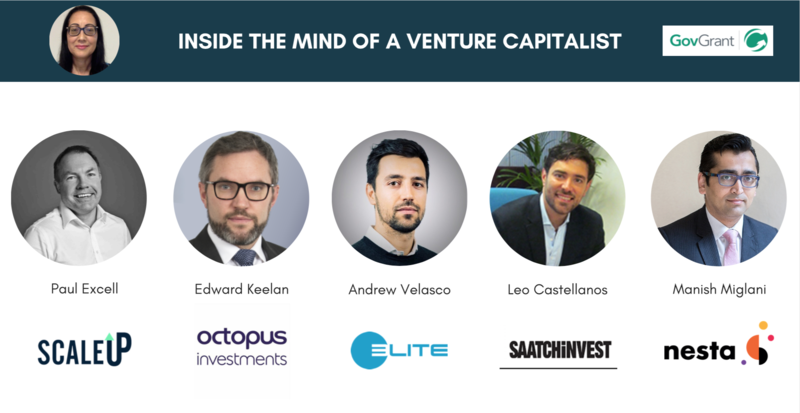 As the panellists made clear, VCs are very particular about who they do business with, and their criteria can be quite rigid. According to Funding Matches data, the preference amongst VCs for post-revenue businesses is obvious, with over 90% stating this as a necessary requirement, and the panel echoed this sentiment. It is a fact that revenue is often the best evidence of traction and market demand, and VCs view this as necessary validation for your product/service. As an example, Edward explained that Octopus looks for fully commercialised businesses with multiple customers, and isn't very flexible when it comes to taking on investees who fall outside of this spectrum. Expected minimum revenue is also a requirement for some VCs, and this can range from a few thousands to a few million. As Manish said however, most VCs will be willing to budge on this front, giving the business proposition itself is very strong, and there is clear evidence indicating future growth potential. Previous funding rounds can also give VCs some validation, as this demonstrates that other individuals/institutions have put faith in your team and idea. This is true especially if these investors have a respectable expertise in your particular field. But is previous funding enough to convince an investor if you're still pre-revenue? 'This will depend on their business model', said Leo, 'as well as the type of industry they're targeting'. 'Say you're an app that relies on users; perhaps revenue is something you'd be thinking about way, way down the line' – said Leo. Therefore, if you can focus on customer acquisition first and foremost, while still having a viable revenue model for the future, this could be enough to satisfy certain VCs. 'Two of the biggest companies in the world right now were pre-revenue for a very long time! ', observed Leo, referring to Facebook and Google. Andrew outlined another important point; 'A biotech company which is very capital intensive wouldn't tend to make revenue until quite late within their cycle of development'. Having said that, a sign of a good biotech company is the amount of capital they've raised previously, often sought for R&D purposes – VCs will look out for this. · Don't make the mistake of seeking VC money too early. Not demonstrating enough progress, and not resonating enough with your potential customers is an instant turn-off for VCs. A good company will make traction with customers who really need their product. · As Andrew put in, 'VCs are becoming increasingly more specialised, in order to differentiate themselves from each other'. Therefore, consider approaching a VC who understands your particular sector. · Explain exactly how your technology differentiates itself from existing market solutions. This is especially true of sector-agnostic VCs, who might not have the specific expertise to evaluate your blockchain or algorithm technology themselves. · Consider not only your product's innovation, but also its social impact – this is very important for VCs like Nesta. · Make sure you're addressing a genuine problem – without this, you have no business model. · Raising money shouldn't be the first thing you think of. First you have to demonstrate skills, knowledge, experience and passion to build a great business. · Understand the position of investors by carrying out proper due diligence. · The founders and team are the most important factors you have to consider in terms of your credibility. · Demonstrate what it is that's going to help you grow and scale – investors need to see real evidence, as opposed to mere estimations. · You are unlikely to get anywhere without at least a prototype that works and is usable. · Carry out market research, know your customer base, understand your competitors and what makes you different. · Traction is everything – the more customers you can acquire before fundraising, the more investors you'll attract, and the better your agreement terms will be. We hope that the event has been a comprehensible view into equity funding for all of our attendees, and that we have set them on a steady path to business growth – or at least nudged them in the right direction! Thank you for everyone who participated, and see you next time.